Ever since July 2014, I found the piece of my soul that has been missing. 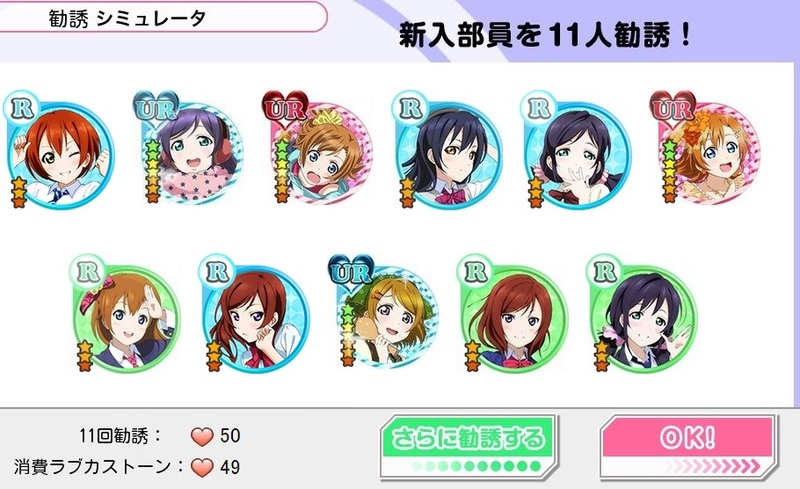 My favorite anime, Love Live School Idol Project, had a game based off the girls. The app is called Love Live School Idol Festival. The app focuses on an alternate universe of the nine idols. In the game there are many different activities that a player can do. 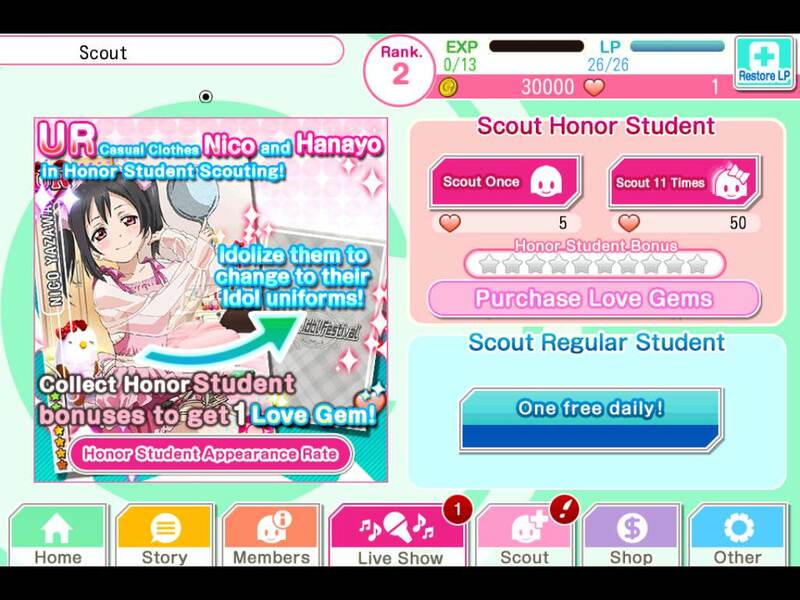 Love gems are items that a player can get for free and pay money to get. Love gems can be used to improve game play. Life points are used to play songs. Every 6 minutes you get 1 life point back. Also, your life points are refilled when you level up. Friend Points allow a player to draw 10 characters that will be normal or rare. Friend points are collected through events and using people you know and don’t know. If you are friends with a person, they give you 10 friend points instead of only 5 friend points. The point of the story mode on the app is to make gaining new songs more fun. The game opens with the story mode to introduce new players to the nine members of μ’s, Honoka Kousaka, Kotori Minami, Umi Sonoda, Maki Nishikino, Eli Ayase, Nozomi Toujou, Rin Hoshizora, and Honaya Koizumi. The story continues with the player following the characters through there lives. This is either preparing for the School Idol Festival, hanging out in the arcade, etc. Completing the goals in the game allow the player to unlock more chapters of the story. By completing chapters, more of the songs are unlocked for the player as well. To complete the goal you either have to level up or play the new song. There is a limited amount of chapters out because there are only so many songs out too. The events help players collect love gems, money, friendship points, and characters. During an event, it is possible to get at least a new super rare character and new normal character. There is a set list of items that can be gained by getting event points. There are two types of events. One event is an event song is given which costs event tokens are used to play the song. The event tokens collected by songs that are not the special song being played. 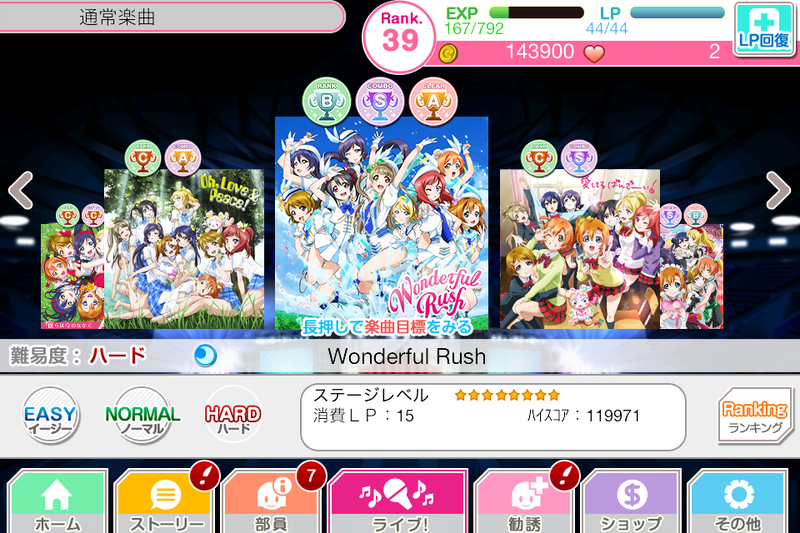 When the event song is played, more event points are collected than when any other song is played. 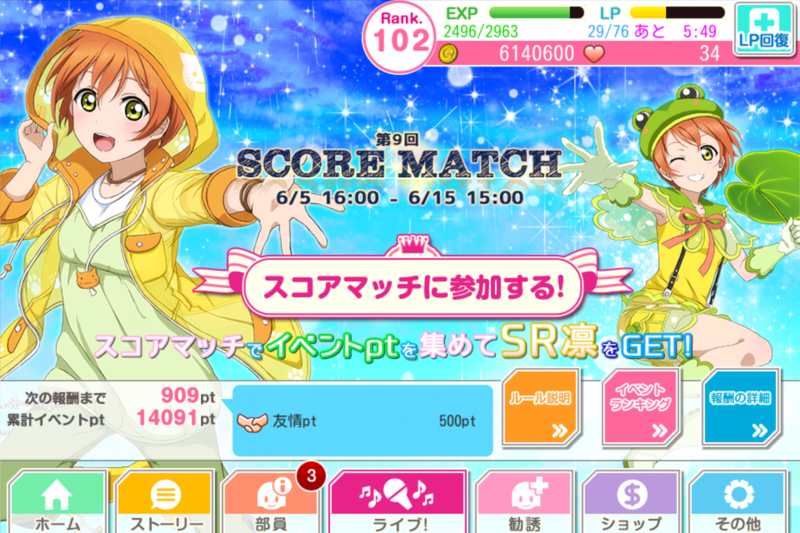 The second event is called “Score Match”. This is where players use life points to face three other players. The player with the highest score on the song gets a larger multiplication on event points. The lower the ranking, the lower multiplication a player gets. All events are a competition between all the players who have have event points. The ranking goes in order of who has the most event points on top and the people who have the least are on bottom. Depending on the ranking at the end of the event, which usually lasts about nine days, the player gets a certain reward. This can either be the best prize of two of the super rare, one of the new normal character, and two scouting tickets or one love gem. The most fun about the game is collecting cards that are rare or higher. They have great skills to add to your team and they have great art. The cards that you collect are usually unidolized. To raise the card to the highest level it can be, you have to practice. To practice, you choose a character that essentially “eats” ten other characters or less to gain experience. The rare characters and higher all have skills. When cards with skills eat other cards with the same skills, the skill of the card that is eating gets a level up in the said skill. The other practice that can happen is a special practice. A special practice is when two of the same characters become an idolized character. Once idolized a character becomes more powerful and it allows a person to fully bond with the character and get a mini story and a love gem. I love this game so much. 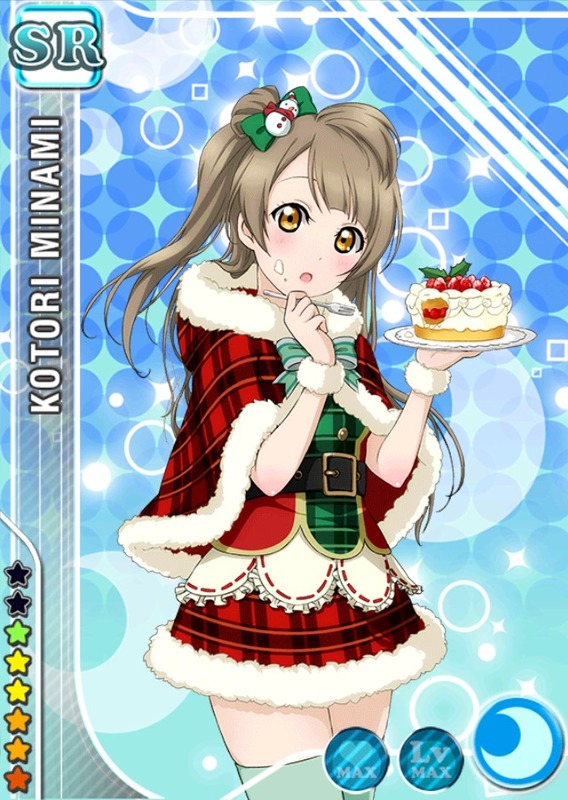 I enjoy collecting characters, mostly just Kotori. 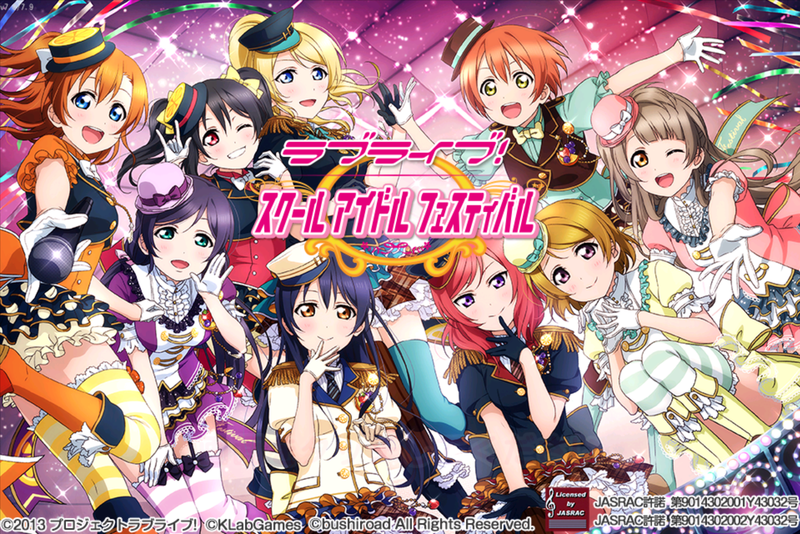 All the members on Witty Anime Viewers are all play Love Live School Idol Festival. We all welcome new friends, so send us a message if you want to become friends.